The Royal Canadian Mint has issued a new coin which pays tribute to one of the country’s most iconic and historically important landmarks, the Peace Tower clock, located on Parliament Hill in Ottawa. At the stroke of noon on the 1st July 1927, the Peace Tower clock and carillon made their timely debut as Canadians celebrated Confederation Day’s 60th anniversary, or the Diamond Jubilee. Ninety years later, this commanding timepiece and its copper-clad apex continue to take pride of place in Canada—it remains a symbol of its political heart and a national icon whose prominence is second only to that of Canada’s instantly recognizable flag. The 92.2-metre (302-foot) tower on Parliament Hill is where the four clock faces continue to mark the passage of time for an entire nation, in times of tragedy as well as during Canada’s finest hours. The tower will be a memorial to the debt of our forefathers and to the valour of those Canadians who, in the Great War, fought for the liberties of Canada, of the Empire, and of humanity. Two years later, the Peace Tower’s foundation stone was laid by Edward, Prince of Wales—later King Edward VIII—during his tour of Canada. Since its inauguration, the tower’s flagpole has acted as the flagpole of the nation. The display of specific banners or personal standards atop the Peace Tower is subject to a strict and intricate protocol, such as half-masting for national mourning, and showing the flag of the sovereign (or of any member of the royal family) or the flag of the governor general, when any of those persons are present on Parliament Hill. The Peace Tower clock is set to Canada’s official Eastern time zone, as measured by the National Research Council’s atomic clock. 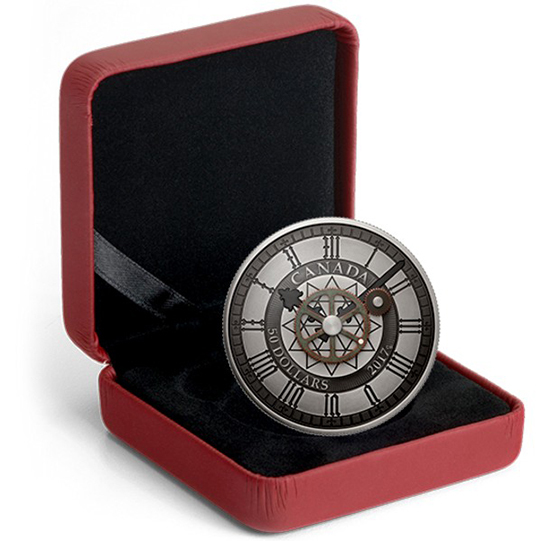 Fans of clock–themed coins: At the time of this posting, Coin Update sponsor APMEX has an array of clock-themed coins in stock (including COTY Award–nominated designs) from the Monnaie de Paris and other mints around the world. Click this link to check them out. The master clock runs on an electric motor located in a small room inside the tower. It is mechanically connected to keyboard of the 53-bell carillon, whose bells ring out every 15 minutes, while the 10,160-kilogram (22,400-pound) bourdon rings out on the hour. It is said that the clock moves forward, never backward. Thus, when Daylight Saving Time (DST) comes to an end in autumn, the clock is manually stopped at 2 a.m. for a full hour before resuming. And when the clock needs to “spring ahead” for the start of DST, the carillon is temporarily disconnected before the hour hand is moved forward one hour. 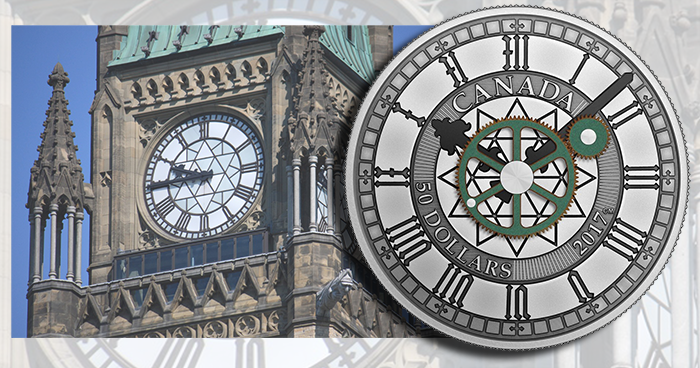 The coin is designed by Canadian artist Calder Moore and features an antique finish that brings an aged elegance to this depiction of the Peace Tower Clock. Precision engraving re-creates one of the four identical faces that grace each side of the iconic clock tower. 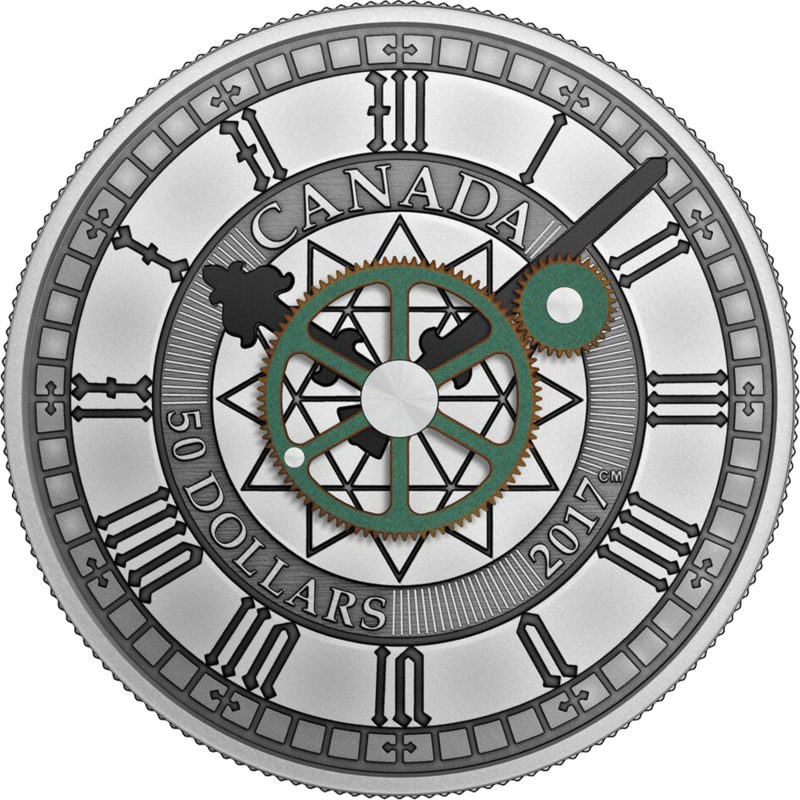 The Roman numerals, minute markers, and geometric-inspired centre pattern are all beautifully and faithfully reproduced on the reverse; in fact, the only engraved addition is the widening of the centre’s circular frame to include the engraved words “CANADA”, the year “2017” and the face value of “50 DOLLARS”. The hands of the clock are attached to the centre of the coin, forming an immobile base for the two gearwheels that provide a glimpse at the clock’s inner workings. They are exact, small-scale replicas of two of the clock’s gears: the larger wheel has 90 teeth, while the smaller pinion has 32. For added historical value, these cogs are fashioned from copper that once clad the roofs of Canada’s parliament buildings; any colour variations or markings have been preserved to make each coin unique. 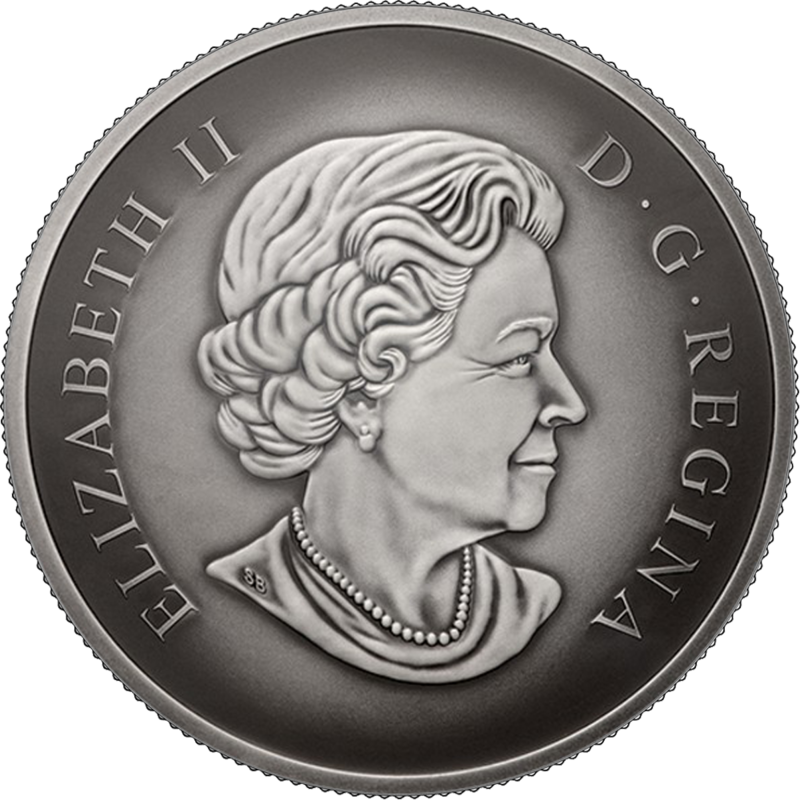 The obverse features the effigy of Her Majesty Queen Elizabeth II which was created by Susanna Blunt and has been in use on all Canadian circulation and many commemorative coins since 2003. The coin is encapsulated and presented in a Royal Canadian Mint–branded maroon presentation box with a protective outer box, and includes a serialized certificate of authenticity. For more information on this and other coins in the series, please visit the website of the Royal Canadian Mint.